"My 100th post of 2012"
As a thank you to all my lovely readers, I have teamed up with Chicnova to conduct a giveaway for the upcoming holiday season. 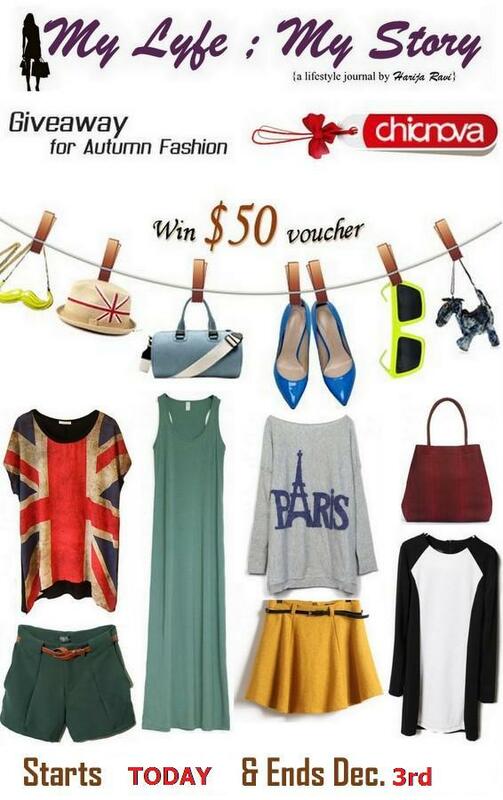 So, for this holiday season, one of my lucky readers of My Lyfe ; My Story will win a $50 voucher sponsored by ChicNova. 4) Leave a comment on one of my past posts. All the items on the collages are from the site ChicNova and these are the items that I love! Congrats and done worry I will be hosting more giveaways soon! & i just enter the giveaway too! Enter me tooo... I akready enter on the form! I am entering this givewaay! good luck to everyone and I entered on the form! Enter me as always I am entering you giveaways! I love the army green dress. the dog blouse is my pick and I think it will go perfectly with black skinny pants! I love the Black Leather Drawstring Bandeau Top.